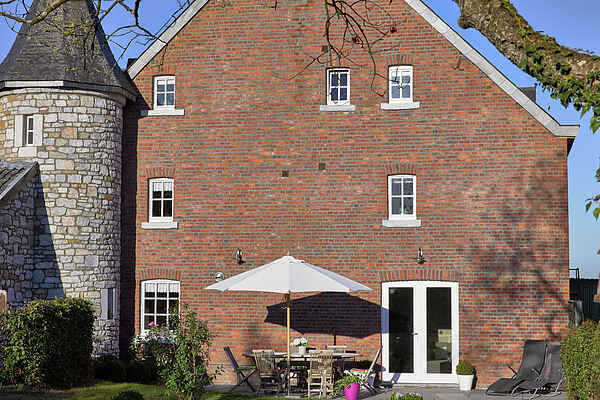 This charming holiday home is located near the town of Limburg and offers breathtaking views over the High Fens nature reserve. The holiday home is situated in a beautiful farmhouse, restored with attention to detail. The decor is warm and cosy and the location is great. The garden is completely enclosed and you can enjoy the sun on the patio. Besides a petanque court and a trampoline, you'll also find a sauna in the garden! The indoor play area in one of the annexes offers plenty of entertainment for the children. This holiday home is mainly aimed at families. For the daily shopping you can go to Dolhain (2 km). The nice town of Limburg, at just one kilometre, with its renovated flower-decked houses, distinctive architecture and original atmosphere, is highly recommended. The protected High Fens nature reserve is fifteen kilometres away. Lovers of peace and quiet can take beautiful walks here and during the season you can also go skiing and cross country skiing. A visit to the town of Spa (18 km), with its thermal baths and casinos, should of course not be missed.